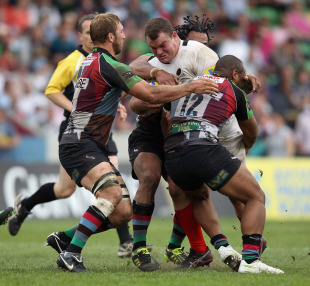 Saracens prop Matt Stevens has been named in the England Saxons' squad for the Churchill Cup. Stevens missed Saturday's 38-32 defeat by the Barbarians due to his involvement in the Aviva Premiership Final 24 hours earlier, but has been included in the 24-man party. It is the first time he has featured in an England squad since completing his two-year ban for cocaine use. The 28-year-old won the last of his 32 caps in November 2008 and is on course to be selected by Martin Johnson for the World Cup this autumn. Stevens is joined in the squad by another South African-born player, lock Mouritz Botha, who was playing for Bedford until as recently as 2009 and is selected following a fine season for the Premiership champions. The Saxons have picked their youngest ever squad with an average age of 23 for their defence of the Churchill Cup, which begins against the USA at Franklin's Gardens on Saturday. Henry Trinder, Charlie Sharples, Rory Clegg, Joe Gray, Kieran Brookes, Billy Twelvetrees, Jamie Gibson and James Gaskell are 22 or younger and will make their tournament debuts. Harlequins prop Joe Marler (concussion) and Northampton fly-half Stephen Myler (broken toe) sustained injuries against the Barbarians and have been ruled out of the competition with replacements yet to be announced. Northampton flanker Calum Clark (back) and Saracens back row Andy Saull (dead leg) will also miss the Churchill Cup, so Gaskell and Gibson have been called up. Only four players were on duty in last year's final - the 38-18 victory over Canada - with Alex Goode, Young, Graham Kitchener and Luke Narraway surviving. Saxons head coach Stuart Lancaster believes the Churchill Cup will provide England's emerging talent with invaluable international experience. "It's a great opportunity for so many young players to test themselves against sides like the USA and Tonga who are preparing for the World Cup," said Lancaster. "The players involved against the Barbarians will have taken a lot out of a match against some really experienced internationals. "Now the challenge is to bind them together with players coming in from the two Premiership finalists to produce an effective performance against the USA on Saturday." After meeting the USA, the Saxons face Tonga at Gloucester on Sunday with the finals day at Worcester on June 18. Forwards: D Attwood (Gloucester), M Botha (Saracens), K Brookes (Newcastle), J Crane (Leicester), J Gaskell (Sale), J Gibson (London Irish), J Gray (Harlequins), T Johnson (Exeter), G Kitchener (Worcester), M Mullan (Worcester), L Narraway (Gloucester), D Paice (London Irish), M Stevens (Saracens). Backs: M Benjamin (Worcester), M Brown (Harlequins), R Clegg (Harlequins), A Goode (Saracens), P Hodgson (London Irish), T Ojo (London Irish), C Sharples (Gloucester), H Trinder (Gloucester), J Turner-Hall (Harlequins), B Twelvetrees (Leicester), M Young (Newcastle).